Agar’s range of Spray and Wipe Cleaners are specially formulated to suit specific requirements and applications, each product makes cleaning hard surfaces fast and easy. It can dissolve dirt and grime without delay leaving dry to a sparkling finish and without any sticky residues or streaks behind. Agar Citra-mist Spray and Wipe Cleaner is an environmentally preferred, phosphate-free, highly effective and fast-working spray and wipe cleaner which dissolves and removes soilage from all hard surfaces. Made using organic, renewable ingredients. It is a fast-working spray and wipe cleaner excellent for cleaning all types of walls, table tops, benches, doors, Laminex, painted surfaces, vinyl and all other washable surfaces. The pleasant perfume is intentionally mild to prevent irritation and maintain good indoor air quality. 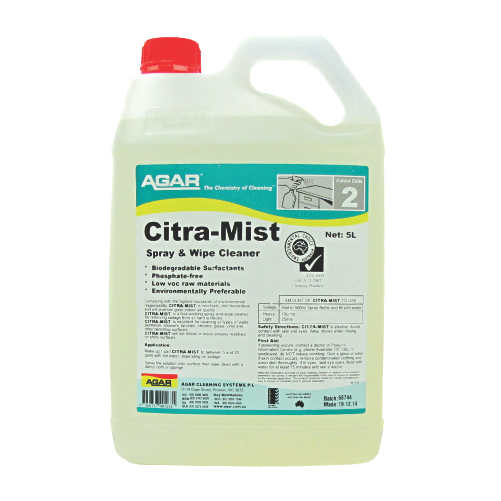 With a spray and a wipe, CITRA-MIST will remove soil in one pass with no residues of ‘films’ being left on the surface. Agar Jetsol Detergent Stain Remover is a powerful grease cutting cleaner which attacks and dissolves a wide range of soils, including ink, from washable hard surfaces. It contains powerful surfactants and water-soluble solvents for rapid attack of soilage and stains. 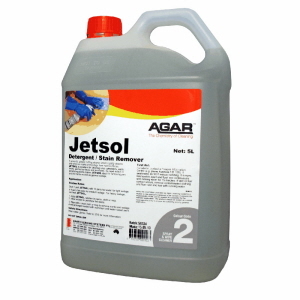 Jetsol concentrated water-based cleaner and stain remover will clean all washable hard surfaces - walls, stoves, laminex, glass, shower recesses, paintwork, venetian blinds, porcelain, stainless steel, chrome etc. This general purpose hard-surface detergent and ink remover is recommended for bank counters and desks in schools and offices. 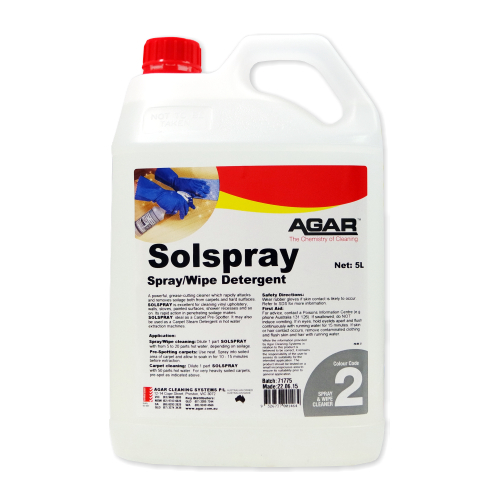 Agar Solspray is a unique solvent detergent dissolves grime,smoke films, ink marks and routine soil from hard surfaces including doors, walls, desks, tables and carpets without leaving residues. Solspray is a concentrated solvent cleaner, grease remover and spotter for spray/wipe application. Available in 5L and 20L. 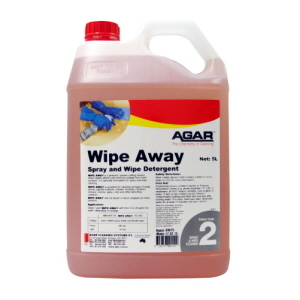 Agar Wipe-Away Spray and Wipe Detergent is an economical, versatile fast-working spray and wipe cleaner with perfume that leaves surfaces smelling clean. It can remove all types of daily soilage from hard surfaces, without leaving streaks. It is excellent for cleaning all types of walls, stoves, painted surfaces, shower recesses, table tops, laminex, vinyl and all other hard surfaces. Available in 5L and 20L.